When James Hutton and John Playfair's observed this unconformity in 1788 they were at the point of making one of science's greatest discoveries; appreciation of the enormous age of the earth. 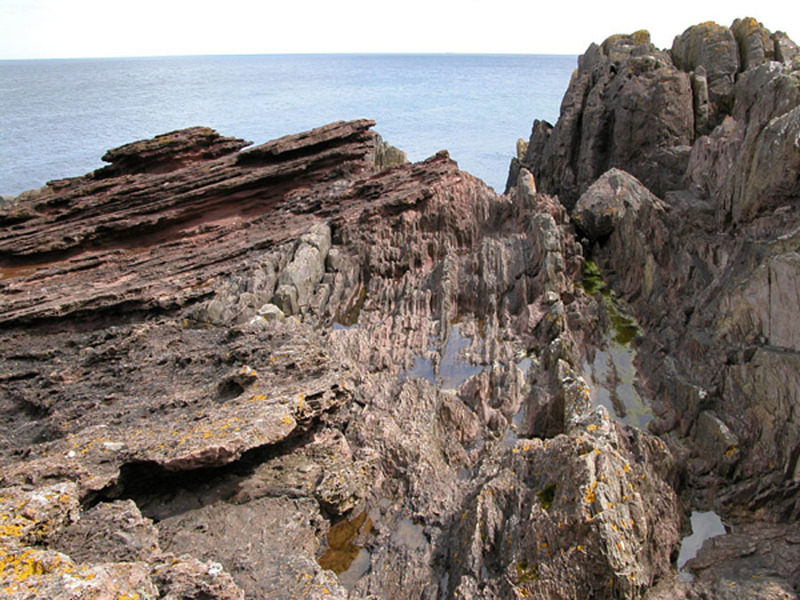 Vertical beds of Silurian slate are directly overlain with nearly horizontal upper Devonian red sandstone. We now know that the vertical beds of slate were laid down about 425 million years ago and the covering horizontal ones nearly 100 million years later. But Hutton and Playfair did not know this. "On landing at this point, we found that we actually trode on the primeval rock, which forms alternately the base and the summit of the present land. It is here a micaceous schistus, in beds nearly vertical, highly indurated, and stretching from south-east to north-west. The surface of this rock runs with a moderate ascent from the level of low-water, at which we landed, nearly to that of high-water, where the schistus has a thin covering of red horizontal sandstone laid over it; and this sandstone, at the distance of a few yards farther back, rises into a very high perpendicular cliff. Here, therefore, the immediate contact of the two rocks is not only visible, but is curiously dissected and laid open by the action of waves." Gradually the meaning sunk in. The underlying (now vertical strata) must have been turned to the vertical in some great volcanic or tectonic upheaval, then eroded by glaciers or whatever, until finally the sea level rose and a second phase of sedimentation laid down the red sandstones. "The palpable evidence presented to us, of one of the most extraordinary and important facts in the natural history of the earth, gave a reality and substance to those theoretical speculations which, however probable, had never till now been directly authenticated by the testimony of the senses. We often said to ourselves, What clearer evidence could we have had of the different formation of these rocks, and of the long interval which separated their formation, had we actually seen them emerging from the bosom of the deep? We felt ourselves necessarily carried back to the time when the schistus on which we stood was yet at the bottom of the sea, and when the sandstone before us was only beginning to be deposited, in the shape of sand or mud, from the waters of a superincumbent ocean. An epoch still more remote presented itself, when even the most ancient of these rocks, instead of standing upright in vertical beds lay in horizontal planes at the bottom of the sea and was not yet disturbed by that immeasurable force which has burst asunder the solid pavement of the globe. Revolutions still more remote appeared in the distance of this extraordinary perspective. The mind seemed to grow giddy by looking so far into the abyss of time; and while we listened with earnestness and admiration to the philosopher who was now unfolding to us the order and series of these wonderful events, we became sensible how much farther reason may sometimes go than imagination can venture to follow."